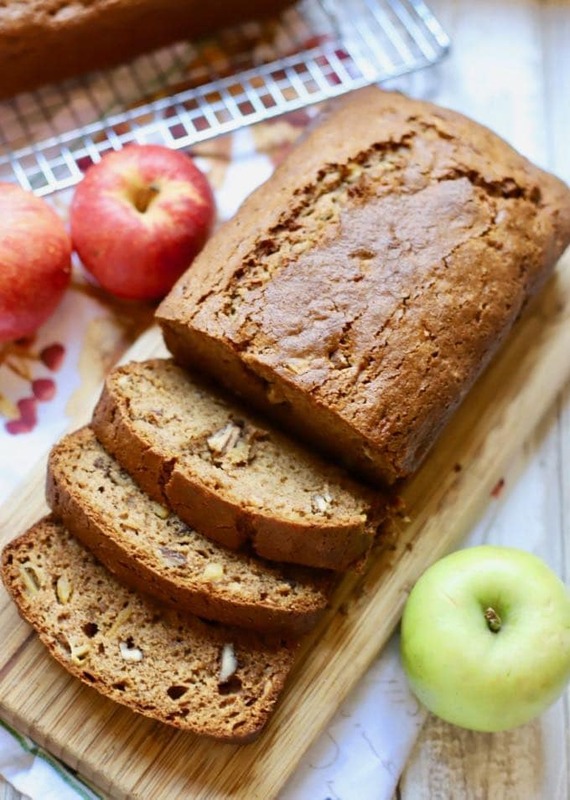 Easy Southern Style Apple Bread is the perfect dish to welcome fall. Crisp, sweet apples, crunchy pecans, and a secret ingredient, sour cream, fill this luscious, moist apple bread with pure deliciousness! A generous slice of Easy Southern Style Apple Bread is fabulous with a cup of coffee for a light breakfast, a yummy snack, or even as a sweet ending to a good meal. This apple quick bread is simple to make and only takes minutes to prepare, and you won’t need to pull out your mixer because you can mix everything by hand. Freshly picked apples and newly harvested pecans are synonymous with fall in our area, and the grocery stores and farmers markets are full of every type of apple imaginable. I’m told that pecans will be a little pricey this season because of the two hurricanes that recently blew through our area, but this recipe only calls for half a cup of the delicious nuts. I won’t try to convince you that this bread is healthy, but it is a healthier option than some other types of bread or desserts. 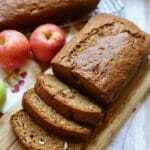 Apples and pecans both are loaded with fiber, vitamins and other nutrients, and if you want a delicious treat or are looking for something to make with apples, this apple bread is a fabulous choice. You can also make it ahead and freeze it. If you like this recipe for apple bread, you might also like my Easy Southern Peach Bread, Apple Dapple Cake with Caramel Glaze or Easy Crockpot Pork Chops and Apples. To make this Easy Southern Style Apple Bread Recipe you will need fresh apples (I used Honey Crisp apples, but you can use any variety you like or have on hand), applesauce (optional), vegetable oil, granulated sugar, brown sugar, eggs, sour cream, vanilla, all-purpose flour, baking soda, kosher salt, toasted pecans and ground cinnamon. Use a non-stick baking spray with flour to grease the bottom of a large loaf pan. Or, you can use butter to grease the bottom and then sprinkle a tablespoon of flour or sugar over it. Tap the pan on the counter to evenly distribute the flour or sugar and pour out any excess. Add both sugars and oil to a large bowl and mix well. Add the eggs, sour cream, vanilla and applesauce (if you are using it) and mix well. Combine the flour, baking soda, salt, and cinnamon in a small bowl and add to the wet ingredients. Mix well. 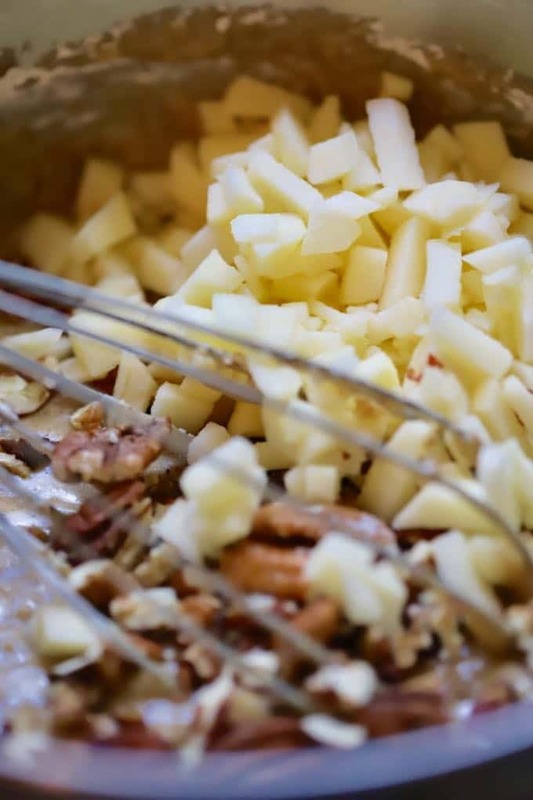 Add the grated or chopped apples and pecans and stir to combine. Pour the batter into the prepared loaf pan and bake for 50-55 minutes or until the sides of the bread just start to pull away from the pan, or when a toothpick inserted into the center comes out clean with no streaks of batter. To be the first to receive notifications of new posts by email enter your email address here or in the Subscribe box. 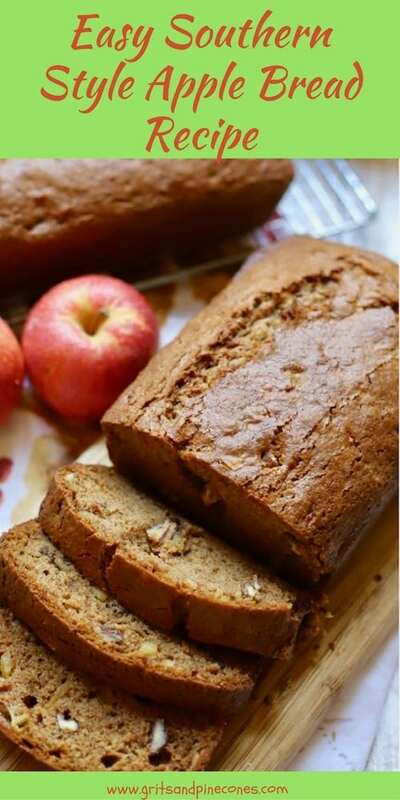 Easy Southern Style Apple Bread is the perfect dish to welcome fall. 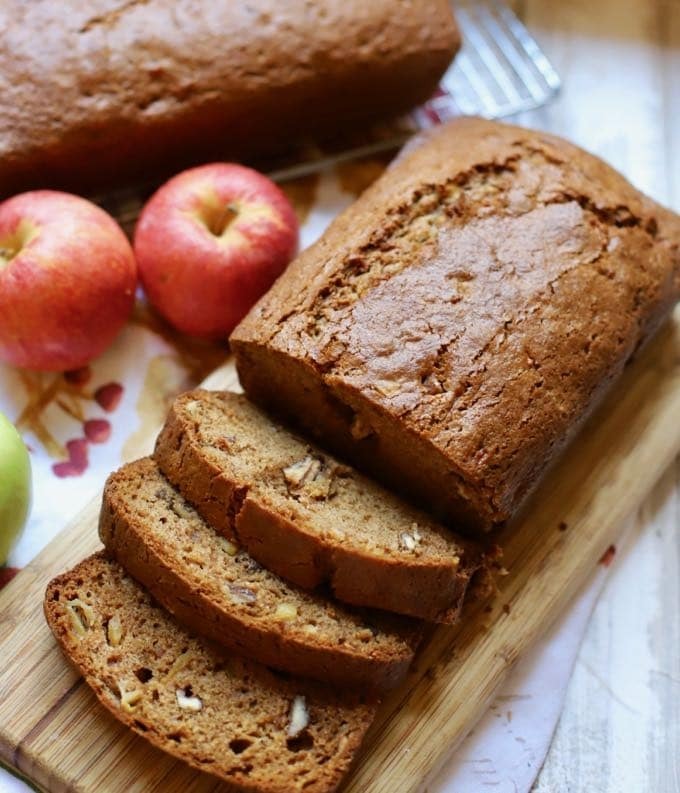 Crisp apples, pecans, and sour cream fill this luscious bread with pure deliciousness! 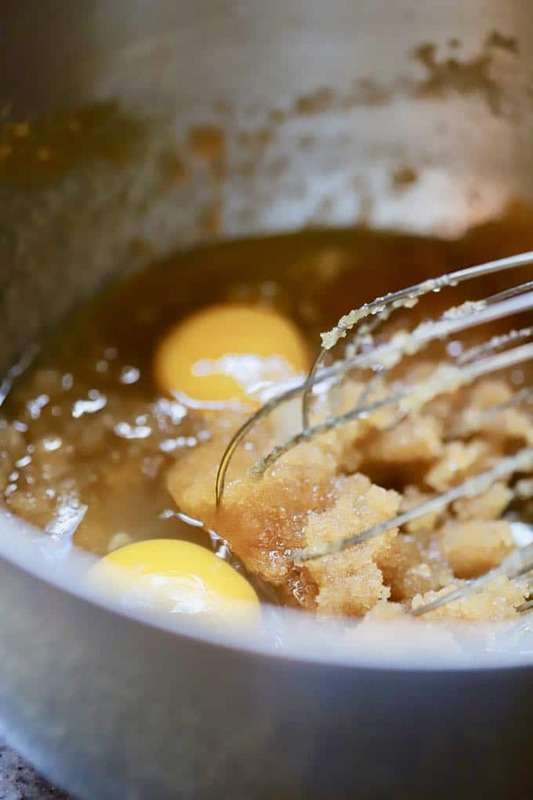 Add the sugar and oil to a large bowl and mix well. Add the eggs, sour cream, vanilla and applesauce if you are using it and mix well. Combine the flour, baking soda, salt, and cinnamon in a small bowl and add to the wet ingredients. Mix well. Add the grated apples and pecans and stir to combine.